Creamy Al Fungi Pasta Mushrooms in rich creamy white & cheese sauce. Shaving CreamRs. 150 | 75gVitamin Enourishes & moisturizes skin.Eucalyptus & Rosemaryanti-bacterial propertiesMentholskin relaxant & protectantHerbs & More Vitamin Therapy Shaving Cream contains vitamin E, Eucalyptus, Rosemary & Menthol. 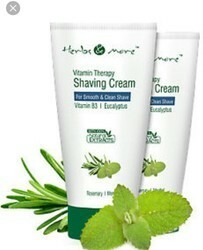 It helps in smooth shaving as well as heals small cuts during shaving. Aloe vera lather shaving cream for smooth shave. Enriched with other skin toning ingredients maintains skin textures. Our reputed entity is engaged in supplying Aloe Vera Based Shaving Cream. Catering to the requirements of our clients, we are involved in offering Shaving Cream (Aloe Fresh Shaving Cream). We are engaged in offering Aloe Fresh Shaving Cream. We are engaged in offering high quality Deluxe Shaving Cream. A highly concentrated, moisturizing formula with soothing aloe vera provides ideal protection against drying and chaffing. It maximizes water absorption and softening unwanted hair for effortless razor glide. Enhanced by fresh and energetic fragrance for the sporty and free-spirited man. It is an excellent shaving cream. It contains aloe vera and vitamin E. Aloe Vera extract and vitamin E is good nutrition for the skin. It moisturizes the skin and makes it smooth soft and fresh. Aloe fresh shaving cream is made from a generous amount of 100% pure and organic Aloe vera gel that not only helps work up a good lather but leaves the skin smooth, supple and moisturised after the shave. A highly concentrated, moisturizing formula with soothing ALOE VERA provides ideal protection against drying & chaffing. It maximizes water absorption & softening unwanted hair for effortless razor glide. Enhanced by fresh & energetic fragrance for the sporty and free-spirited man.